Many thanks for all your emails about the Skoda vs Sherman web page. 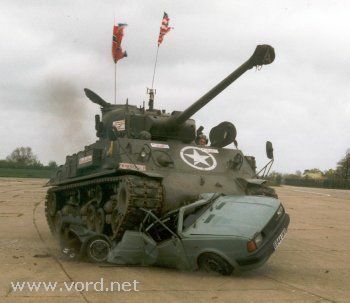 Why did you have to crush a-sound-but-scruffy Skoda with that tank? Did I mention the car was crushed in 1997? Otherwise I'd better modify the page to avoid all the hate mail. Back then the cars were at the end of their normal life and there were many in scrapyards better than the one we ran the tank over (it was rotten at the seams). If anything we extended it's life by a week or two - would have gone straight to the crusher if it hadn't been for us. Know how you feel though - I'm into Renault 4s. 7 million made, less than 100 left on the road in the UK. I'm actively saving the remainder. I'm relieved that the Skoda you ran the tank over was a rotten one. It often seems that way that a car that looks sound from a glance is terminally rotten under the surface. Oh and by the way I like the Renault 4s too. The Renault 4 and the Skoda have a few things in common namely that they have loyal owners clubs in Britain! As it happens, with less than 100 left in all the model variations left in the UK, a parts car is worth several hundred, a basic runner is worth about £300 and a mint condition but useable car is worth about £1k. In open internet auction they are actively sought after. So congrats, you just threw money away. Doesn't save the car, but it makes me smirk to know that some people will always be stupid no matter how money is ploughed into education and how the human animal evolves. Congratulations. Yeah it was fun, but was it really, really, really worth the financial loss? Even Clarkson hasn't trashed a Skoda. A lada, fso, Volvo and Datsun yes, but not a Skoda. What does that tell you? Yours with sympathy for the juvenile mind. Many thanks for your contribution. It's reassuring to hear I'm still ahead of Clarkson. Sadly your business model doesn't take into account the cost of storing the car from 1997 (when we crushed it) to the present day. The going rate for storage is £50 per month, so storing the car for nearly 10 years would have set me back £5000. Squishing the car with a large tank was actually the more economical option. Oddly enough there were some really nice Skodas sitting in scrapyards back in those days. It's a shame that enthusiasm for old cars only really gets going after the vast majority of production has been scrapped.